Image of a ribosome — the part of the cell where proteins are synthesized — captured with a cryo-electron microscope at Pfizer’s Groton, Connecticut, site. Cryo-EM can achieve a resolution of about 3 angstroms — three-tenths of a nanometer. The history of microscopes is one of ever higher magnification, enabling scientists to peer deeper and deeper into the minute details of nature invisible to the naked eye. The latest category of this powerful tool is what’s called a cryo-electron microscope, and its groundbreaking properties are revolutionizing the way scientists are imaging the smallest of structures — especially in the life sciences. 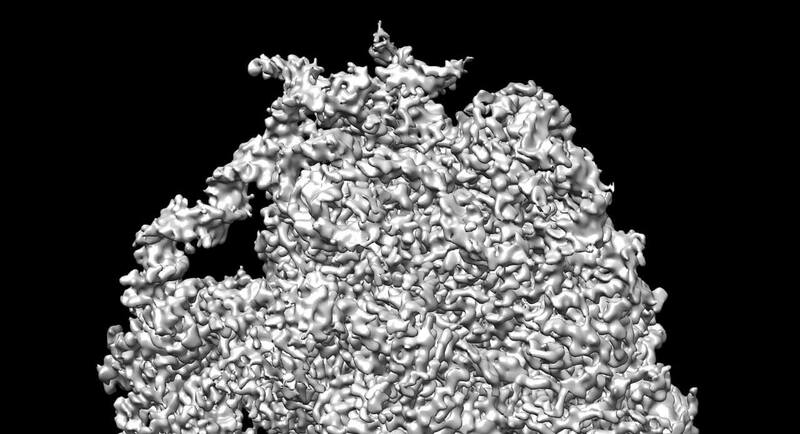 The cryo-electron microscope, or cryo-EM, is allowing scientists to image structures as small as viruses and ribosomes — the part of the cell where proteins are synthesized. More importantly, it does this without the need to turn the samples into crystals — the often tricky step needed when using X-ray crystallography, which has until recently been the go-to technology when imaging microscopic structures. “We call it a resolution revolution,” says Seungil Han, Associate Research Fellow at Pfizer’s Groton, Connecticut, site, which is currently home to the only fully operational Titan Krios microscope in the world outside of academia. It began operating in October 2016. With cryo-EM, you don’t need the sample to be in crystal form, and you can still achieve a resolution of about 3 angstroms — three-tenths of a nanometer. A chlorine atom, for example, has a radius of about 1 angstrom. The theoretical limit of resolution of an optical microscope is on the order of the wavelength of the light that is used. Since visible light has a wavelength of about 4,000 to 7,000 angstroms, an optical microscope — even under ideal conditions — can’t reveal structures much smaller than that . However, when you use a beam of electrons as the source of “light” — as is done with transmission electron microscopes — you can achieve resolutions on the order of 1 angstrom. Shooting a beam of high-energy electrons onto a sample is fine if it’s an inert object, but when the target is biological, like a fragile protein, that’s a recipe for damage. “If you shoot a high dose of electrons, you will pretty much fry a biological sample,” Han explains, noting that’s one reason why the target is frozen to liquid nitrogen temperatures. That’s where the cryo-EM gets the “cryo” part of its name. Pfizer’s Groton, Connecticut, site, is currently home to the only fully operational Titan Krios cryo-electron microscope in the world outside of academia. It began operating in October 2016. The cryo-EM at Pfizer’s Groton site is a hulking structure about the size of a large van that sits in a darkened, temperature-controlled room. Once a sample is loaded into the microscope, the machine can operate autonomously for a few days, spitting out image files that are 2 to 3 terabytes in size — the equivalent of thousands of high-definition movies. To process that huge amount of image data, Han and his team employ a computer with powerful graphical processing units developed in the video gaming business. “If your processing capabilities are too slow, you can’t keep up with the data,” Han says, noting that advances in computer hardware and programming were integral in making cryo-EM viable as much as the detector itself. And because the cryo-EM can create 3-D images, or even “movies,” a cryo-EM image of the same resolution as an X-ray crystallography image is more useful, says Han, a biochemist who was trained as an X-ray crystallographer. “We’ve already gotten some atomic structures since the grand opening, and we’re quite excited about it,” Han says. It’s one thing to know the structure of a protein. But how does that help scientists, for example, create better medicines? Cryo-EM could also help scientists create better vaccines, such as the RSV vaccine, which is given to women to protect their babies from the respiratory syncytial virus (RSV), Han says as he points to a poster of the triangular shaped virus successfully imaged in his lab recently. “We’re really keen on making an impact using this technology,” Han says.